The latest appeal against the minimum pricing for alcohol policy goes to the Supreme Court today and the neo-temperance lobby has been busy creating noise to influence the decision. This case was brought by the Scotch Whisky Association and challenges the policy on the grounds that it breaches EU rules on free trade. The case was bounced from European Court of Justice to the Scottish court and has now gone to the Supreme Court on appeal. 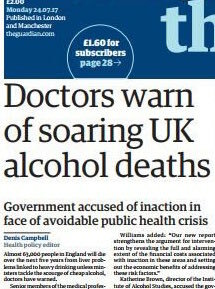 Upon reading the article, you will find that it is not a group of doctors making this claim, rather it is “some of Britain’s leading academic experts on alcohol”. Those of you who follow alcohol politics won’t be surprised to hear these “academic experts” are the usual bunch of modellers from Sheffield University who have been producing research favourable to minimum pricing whenever the Scottish government asks for it. But even these “academic experts” are not claiming that alcohol-related deaths are “soaring”. Because they are not. 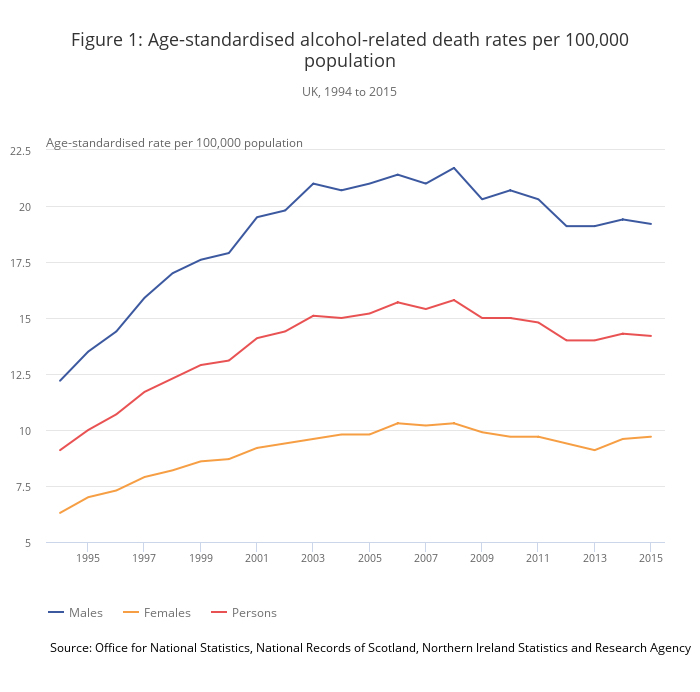 As you can see, alcohol-related deaths have been declining in recent years and this is mostly due to a sharp decline in Scotland, the country at the centre of the minimum pricing row. In other words, it would reduce the number of deaths by less than two per cent. And that is based on a dreadfully flawed model which uses unrealistic assumptions about price elasticity to inflate the positive effect. How much money will the British public have to shell out on needlessly expensive drinks to achieve this feeble and almost certainly exaggerated benefit? Alas, we are not told because there is no attempt to look at the policy on normal cost-benefit grounds, nor does the article quote any of the policy’s numerous critics. It does, however, quote Ian Gilmore and Katherine Brown, both of whom are part of the Alcohol Health Alliance and are members of the tiny clique of activists who work with Public Health England and the Chief Medical Officer to influence government policy. The Sheffield team is very much part of that clique and has become virtually a monopoly provider of research promoting minimum pricing. They were commissioned by the Scottish government to look at the policy after the SNP had already committed itself to it. Later, when politicians complained that the policy is regressive and would hurt moderate drinkers, they conjured up some figures which purported to show that it wouldn’t. When the European Court of Justice said that minimum pricing would only be legal if it had more impact on heavy drinkers – including wealthy heavy drinkers – than tax rises, the Scottish government commissioned them to produce some research showing that it would. And now, as the latest court case begins, they pop up again with some more conveniently timed propaganda given exclusively to their friends at the Guardian who have added a fake news headline and slapped it on the front page. This is great campaigning. It is well-timed, well co-ordinated and may succeed in influencing the court case, as it is obviously intended to do. But let’s be clear that it is campaigning. It is not a disinterested cost-benefit analysis from some dry academics. Assuming that Brexit happens, minimum pricing will be introduced in Scotland one way or the other, regardless of the outcome of this week’s court case. When that happens, we will have an opportunity to assess some real world evidence, rather than relying on endless variations of a computer model. But I wouldn’t get too excited about the prospect of an independent review. The task of evaluating the policy has already gone to – you guessed it – Sheffield University.